Joseph Joseph has fast-become one of the most desirable kitchenware brands in the world since twins Richard and Antony Joseph founded the brand in 2003. Joseph Joseph's innovative range of kitchenware products are designed to help you maximise kitchen space and be fun to use. Characterised by an eye for detail and quality, Joseph Joseph utensils and kitchen accessories are durable, stylish and functional. Utensils include peelers, ice cream and potato scoops, turners, straining ladles, soup ladles, small and large spatulas, spaghetti claws, citrus catchers, brushes, ice trays and much more. Best-known for their colourful and design-led products, Joseph Joseph also has some stunning tableware to offer including salt/pepper grinders and double dishes. 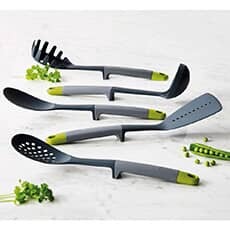 There's also unique worktop savers and other kitchen accessories such as cleaning brushes, sink liners, note clips and silicone pot stands to choose from, and their GoEat range makes it easy and convenient to eat homemade food on the go. And crucially with all Joseph Joseph products, you will find them colourful and playful and they are made to the highest quality. And so with plenty of quality to offer and some of the most colourful designs of any kitchenware brand, Joseph Joseph products are perfect for any modern kitchen or indeed an eclectic kitchen that could do with a little livening up. Discover all Joseph Joseph kitchenware products at eCookshop today and save money on the RRP.